“Menorah” after the arson, September 13, 2015 Photo: Boris Glazunov. 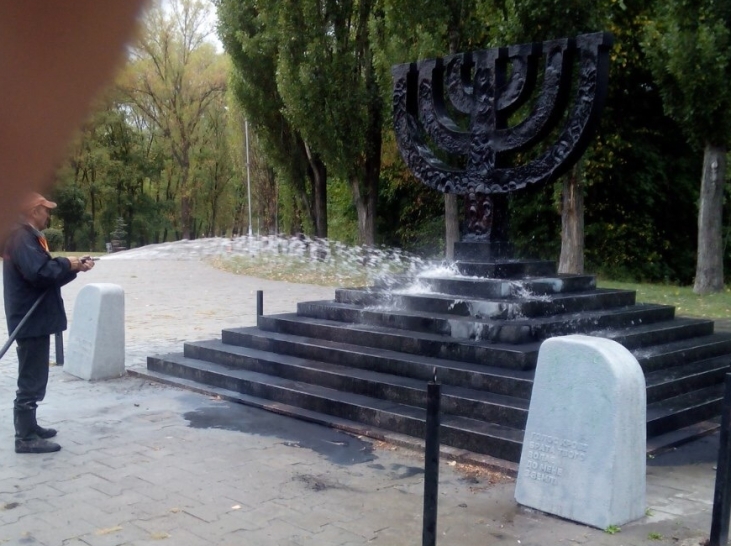 On September 13, the first day of the Jewish new year celebration, a group of nazis desecrated the memorial to over 33,000 Jews killed in 1941 over two days at the Babi Yar ravine in Kiev. Jewish organisations complained about the passivity of the authorities, as this is the sixth attack against this site this year so far. “Assailants put tires around the menorah, poured an inflammatory liquid over them and set them alight,” the Kharkiv Human Rights Protection Group reported. 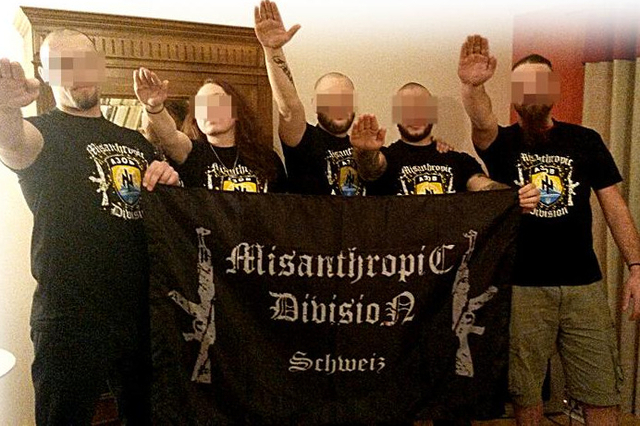 The group which carried out the attack is the Misantropic Division, an openly nazi group which operates as part of the Azov Battallion (which in turn is led and organised by neo-nazis and is under the jurisdiction of the Ministry of Internal Affairs). An estimated 33,771 Jews were killed at the Babi Yar ravine in a two-day massacre by German forces and Ukrainian collaborators in September 1941. The current authorities in Kiev have been engaged in the official whitewashing of those forces which collaborated with the nazis during World War II, including passing a law recognising the OUN and UPA nazi collaborators as “freedom fighters” and criminalising any public questioning of their role. 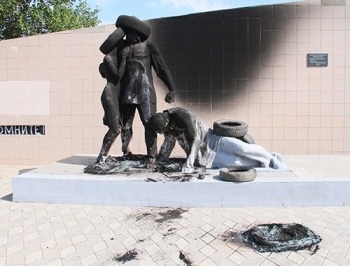 According to the Euro- Asian Jewish Congress, which tracks anti-Semitic activity in Ukraine, this is the sixth attack against this Memorial this year so far and it also is very similar to another attack following the same modus operandi against a Holocaust memorial in the southeastern Ukrainian town of Melitopol last month (see: Anonymous perpetrators burned tires at the monument for Holocaust victims in the suburbs of Melitopol). The Melitopol monument attacked was erected in memory of 12,000 Jews executed at this location during the war sustained heavy damages from the flames lit by the delinquents. Several Jewish organisations in Ukraine issued a joint statement condemning the authorities lack of response. “To everyone’s outrage, public authorities and law enforcement agencies have not taken during this time of effective measures to prevent attacks on the landmark,” wrote Josef Zissels of the Vaad of Ukraine, Arkady Monastic of the Jewish Council of Ukraine, Igor Kuperberg of the Jewish Forum of Ukraine and Victoria Godik of the World Union of Jewish Students. On several occasions “criminal proceedings were initiated and subsequently closed for lack of evidence”. Local and Israeli media reported that no one had claimed responsibility for the attack and there was discussion that this could be the work of anti Ukrainian provocateurs intending to slander the Kiev authorities as anti-Semitic. However the nazi Misanthropic Division had no qualms in releasing a video of the attack they carried out (see here WARNING images that some might find disturbing https://www.youtube.com/watch?v=WoBS7wEXSRg). Furthermore, the video was also posted on several Misanthropic Division accounts on the VK social media network (see http://vk.com/videos162533087?z=video162533087_171313373). Arsene Avakov (right, front) giving medals to members of the Right Sector and Azov Battalions. In the back, to the left, Andrey Biletsky, commander of the Azov Battalion and leader of neo-nazi Patriot Ukraine. Mariupol, June 13, 2015. The Misanthropic Division is a virulent nazi organisation which is part of the Azov Battalion, led by neo-nazis from Patriot Ukraine and the Social National Assembly, now operating under the authority of the Ministry of Internal Affairs as part of the country’s new National Guard. This entry was posted in News and tagged anti-semitism, Avakov, azov, Azov Battalion, Babi Yar, holocaust, memorial, misanthropic division, nazis, Ukraine. Bookmark the permalink.